Choosing a solar battery to store your solar energy. Solar energy from your roof sounds simple, right? The sun shines, electricity is created, and it powers your home. But a lot of people wonder… what happens at night, or on cloudy days when your panels don’t produce? Wouldn’t it be nice to store the extra power you create on a bright, sunny afternoon with a solar battery so you can always make use of solar energy? Solar battery storage isn’t just a household problem, but a challenge the solar industry is tackling as a whole. Solar is an effective, clean, affordable form of power, but it won’t truly be able to take over until storage technology catches up. The industry has been taking off in the past few years, and the race for solar storage has been dubbed a ‘technology arms race’. The good news is, there already are ways to store solar energy in your home! This post will explore the different types of batteries there are, and the products currently on the market, to help you find the best solar battery for your home. Before we get into the types of batteries, a little history: before homes started connecting their solar panels to the utility grid through the ‘grid-tied inverter’ (the most common set-up for rooftop solar now, allowing for net metering), all solar energy systems were effectively ‘off-grid’. That meant that before the 1990s, anyone using home solar had to use battery backup. Now we are in a sort of renaissance for home solar, as it has become repopularized through a set of tax incentives and technical breakthroughs. But because most homes that choose to utilize a battery will still be grid-tied, there are some important characteristics that effective home solar storage batteries must have. Batteries have to be able to adapt to instabilities in grid energy, and inconsistencies in levels of charge driven by the sun. There are a variety of characteristics to consider when selecting a battery, including capacity, density, discharge, and cycle life, so be sure to read up on those when making a choice. Lithium-ion, or ‘Li-ion’ batteries may sound the most familiar – these type of batteries are found in almost all Apple products (your iPhone or iPod), in Tesla vehicles, in computers – the list goes on. They are a good choice for energy storage and solar storage, and are playing a big role in the current solar storage revolution due to their high energy density, little need for maintenance, and light weight. In fact, they are the most common energy storage technology out there. Li-ion battery technology dates back to the 1970s, and as Slate puts it, has always been a little “explosive”- see the Samsung Galaxy Note 7 fiasco. It might surprise you that the first breakthroughs in Li-ion technology were made in the laboratories of ExxonMobil by a Dr. M. Stanley Whittingham, who found a way to make lithium store energy at room temperature without exploding. Several other scientists, including John Goodenough, worked with the concept throughout the 1970s and 1980s, combining lithium with materials like nickel, graphite, cobalt, and copper. Large breakthroughs were then made by Sony in the late 1980s, upgrading until the creation of the Li-ion battery for electric vehicles in 1995. Since then, the batteries have been continually refined for a variety of uses, and while they aren’t without the occasional technical scandal or large-scale recall, are largely regarded as an effective and affordable method of storing electricity. 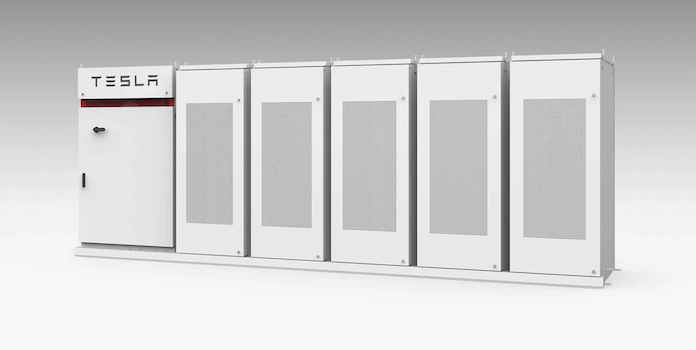 The most well-known solar home storage technology on the market – Tesla’s Powerwall 2 – uses Li-ion construction likely with a nickel, manganese, cobalt oxide (NMC) cathode. The product has a capacity of 14kWh and costs $5,500 with Tesla estimating an additional $1,500 for installation. It can be installed indoors or outdoors and is typically mounted on the wall, something that other, heavier types of batteries may not be suited for. There are several Tesla competitors out there in this space. German company sonnenBatterie uses lithium iron phosphate (LiFePO4) technology, along with energy management software, to create a similar product. The full system retails at $5,950 for 4kWh capacity along with the management system and inverter, but that does not include installation costs. Enphase has the AC Battery storage system, also using lithium iron phosphate technology. The battery can be purchased alongside a variety of other Enphase technologies (similar to sonnenBatterie), but is unique in its small size – each battery only has a capacity of 1.2 kWh, and are designed to be installed in packs. This Enphase product is about $2,000 fully installed for one module (in Australian dollars, which is around $1,510 in USD). LG Chem, a massive producer of various Li-ion batteries, also announced last year plans to partner with Sunrun on a home energy storage system. Finally, unique startup Orison offers an unspecified Li-ion technology that is looking to compete with the Powerwall. It utilizes the same concept: in-home energy storage, but unlike the other technologies listed here, it requires no advanced installation. The Orison comes as either a plug-in lamp-like unit or a wall panel, and 2.2 kWh units run $1,600 apiece. 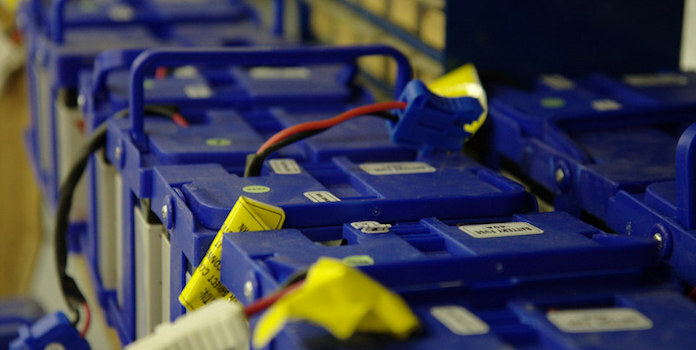 Deep Cycle batteries are an older form of battery storage that comes in several varieties. The ‘sealed’ battery category, also known as “valve regulated lead acid” (VRLA) includes Absorbed Glass Mat (AGM) batteries and gel batteries. AGMs utilize acid in a glass mat separator, and gel batteries use – you guessed it – gel, to store power. These types of batteries are often used in transportation – boats, trucks, even airplanes. One important thing – these batteries aren’t actually completely sealed because that can lead to serious, explosive incidents. Instead, they have valves, hence the more accurate (but less common) VRLA terminology. Where did VRLAs – the AGMs and gel batteries – come from? The first sealed gel cells were reportedly developed in 1934, but not in any type of scale. The first functional gel battery is said to have originated with German company Sonnenschein in 1957. About ten years later, in 1967, American company Gates began researching AGM batteries, and offered two models to the market in 1971 as the first commercialized VRLA product. Development has continued over the years – in the 1980s, AGMs were popularized for military aviation. Today, AGMs are used in many motorcycles, vehicles, and utility-scale wind and solar storage. Gel batteries aren’t generally recommended for home solar storage, but AGMs are recommended as a low-maintenance storage method. VRLAs are not nearly as plentiful on the market as Li-ion batteries, but they do exist, making up around 1% of total energy storage (utility and residential). These batteries tend to be more straightforward, standalone batteries, as opposed to the high-tech energy monitors and slick designs associated with Li-ion products. That also means they are more difficult to couple to the grid through inverters, and thus more frequently used in true off-grid solar systems (but many off-grid systems are still moving toward Li-ion). Trojan Battery has the Reliant AGM, a product that can be utilized in a variety of areas for solar storage, especially in expeditionary areas where panels and settings need to be broken up and moved or are only in temporary existence. Storage Battery Systems has a modular gel battery that can be scaled for residential solar. 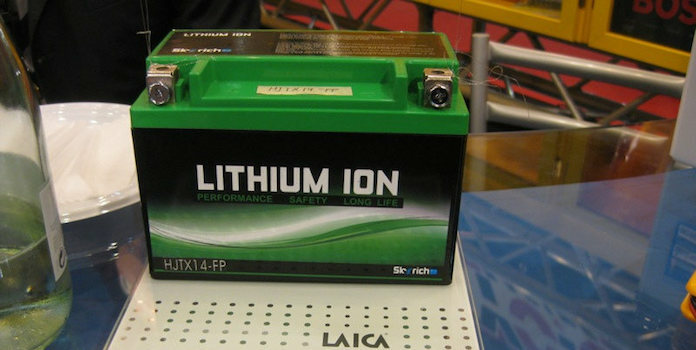 Similar to VRLAs, these batteries are lead acid-based, but instead of being sealed, are ‘flooded’ with an electrolyte that conducts electricity. They have to be maintained because the liquid evaporates off over time, but are a favorite in off-grid renewable storage because they are the most cost-effective. Flooded lead acid batteries are the oldest type of battery we will discuss, first invented in 1859 by Gaston Plante, and further improved for efficacy throughout the 1880s. While the examples today are much safer, as continual improvements have been made, the basic technology is still the same and is still able to compete in the modern battery environment. The flooded lead acid battery market, similar to the VRLA market, is a relatively generic market due to the simplicity of the products and lack of large energy monitoring systems or brand names attached. 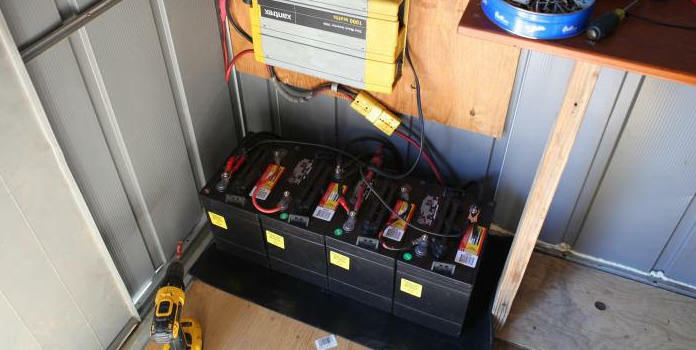 Off the Grid News, a site for off-grid solar enthusiasts categorizes the market as follows: golf cart batteries, where a set of 4 at $75-$150 apiece can give a 4 kWh capacity; L16 batteries; and industrial batteries. 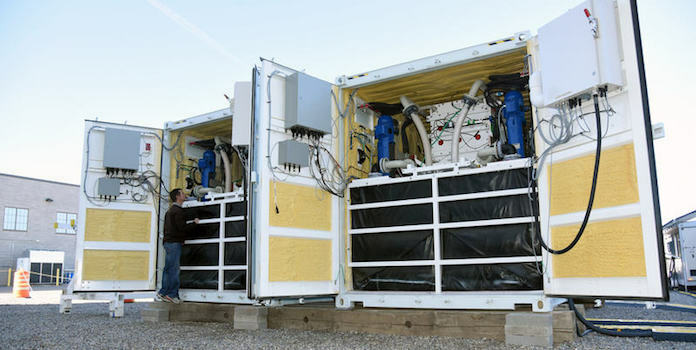 One area of battery technology that currently holds a small share of the market but is expected to grow is the flow battery – most commonly, the vanadium redox flow battery (VRFB). Indeed, it is being hailed by some as an energy storage breakthrough desperately needed to accommodate our needs for solar storage. The technology is simple – two separate containers of liquid flow past each other across a membrane when needed. These batteries are relatively large, so are currently more commonly used at the utility or industrial scale. In addition to vanadium, iron chromium and zinc-bromide are used in flow battery technology. The first flow battery was used in 1884 to power an airship flown by Charles Renard, but didn’t pick up steam again until the 1970s. They are now being looked at by NASA. Developers now anticipate that the ability to produce vanadium from fly ash – somewhat ironically, a byproduct of coal power plants – will reduce costs dramatically over the next decade. The developers are also focusing on integrating management equipment and sensors in order to anticipate evolving needs for smart energy systems. While there aren’t too many flow batteries for home energy storage on the market, there have been some attempts. The company Imergy was developing a 30kWh VRFB battery (larger than needed for homes) for smaller industrial use but went under in 2016. There is one optimistic company out there – Redflow and their new product, ZCell. The ZCell’s capacity is 10kWh, making it larger than the Li-ion options out there (unless stacked in modules), but also making it the world’s smallest flow battery. Instead of the popular large-scale vanadium, the ZCell uses zinc-bromide. Redflow heavily touts the advantages of the ZCell over competitors, citing its lack of fire risk, long shelf life, lack of capacity degradation over time, and ‘genuine, 100% cycle depth’. They say that the fully installed cost will run between $13,000 and $14,500, making it relatively competitive with Li-ion technology when scaled up to 10kWh, and cheaper than the Powerwall. So, are you interested in purchasing solar battery storage technology? If so, we suggest doing more research into these technologies and consulting with multiple installers and electricians to get the best quote for your household. You can also use this online calculator to see how much storage capacity you’d need in your battery bank. There are a few things to think about – such as your willingness to engage in maintenance and your desire for a smart system with applications. If you still aren’t sure, it doesn’t hurt to wait – purchasing home energy storage has long been financially out of reach, but the offerings increase year over year,.. Prices should continue to drop, making this something that is great to look at in the long run. Storage will increase the usefulness of your solar rooftop panels by allowing you to avoid even more utility-generated electricity, thereby continuing to decrease your electric bill and increasing the amount of greenhouse gas-free solar power you can use for your home. But if you do plan to get solar panels installed and are thinking of storage in the future, make sure that your installers know that! This way, you can ensure a ‘forward-compatible’ system. Not all systems can be upgraded easily or cheaply. Are you thinking of solar storage, or do you already have it? If so, tell us what you are using or what you are thinking in the comments!